Rocking an infant is something of an art form. Every baby has their own preference, every mom their own style. How ever you do it, in the first 4 months, you do it a lot. Heck, some moms never stop. I still sway involuntarily when I see a little baby, and I have been know to switch from petting the cat to what seems like burping him... As sweet as it is to sooth your little bundle yourself, occasionally your baby actually benefits from stretching out a little and experiencing their surroundings. Plus you might want to, I don't know, pee or make a cup of coffee? Baby swings are not new, but the technology is starting to really amp up. 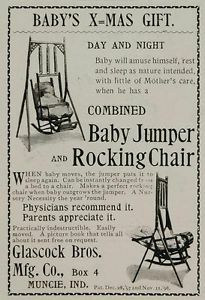 From it's origins in the Victorian home as a simple swing that mom (or nanny) still had to push, to the modern Swingomatic invented by David Saint for the Graco company in 1953, traditionally swings just moved back and forth, or maybe side to side. There were improvements to looks, battery packs, and how compact a unit could be, but no real innovation on how it actually moved. 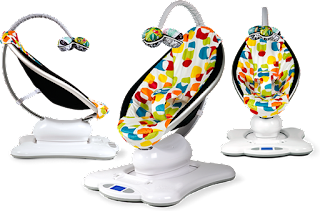 Then in 2006, a clever team of mothers and robotics engineers paired up to create one of the most science filled pieces of baby-kit on the market - the mamaRoo. According to Carnegie Mellon University "[f]or this new product... they put accelerometers on parents as they were holding their babies and captured their motions. 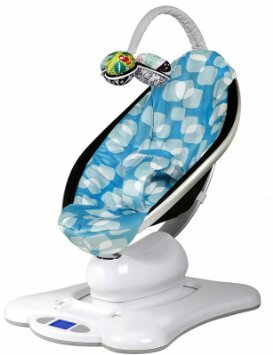 They used the results to develop the five motions of the mamaRoo: car ride, kangaroo, tree swing, rock-a-bye and ocean wave." Add on the futuristic fabrics and the elaborate sound system, and parents are almost unnecessary! Other than for food and diaper duty, of course. There are now even aps you can add to your phone for changing the settings at a distance from the baby, lest they pick up on your scent or make eye contact! In all seriousness though, it seems amazing to me that it took this long for companies to improve on a realistic human movement. The technology is there, but with their finger on the pulse and other companies working hard to catch up, even basic mamaRoo units retail for over $250, while other brands sell for well under $200. Companies like Graco and Fisher-Price are now forced to compete with upgrades to their high end baby models, which could drive mamaRoo down, but their research isn't done. With MP3 plug ins and Bluetooth technology, soon your infant seat will contain more chips than Dorritos. My son loved his more basic swing, but it was lent to us by my cousin's son that hated it! You could register for it and use it once. It could be come your most cherished possession. The thing is, you won't know until you try! If you have a friend that owns one, you might want to try your child in it before forking out the big dough. You might also look for one resale. They are pretty new to market, and really only used for the first six months of your child's life, so second hand might be a great way to save some cash!